Mike Ullery|Call Photo Former Versailles and University of Dayton basketball standout Justine Raterman is congratulated by fellow Hall of Fame member Brian Harlamert after her induction into the University of Dayton Hall of Fame. For former Versailles and University of Dayton standout Justine Raterman, there was never much time to reflect on her accomplishments during her playing career. She was too busy taking her teams to new heights and raising the bar. 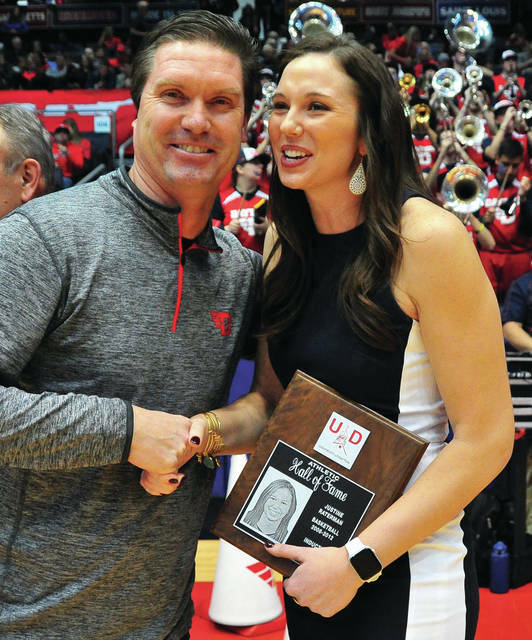 Sunday afternoon, on the University of Dayton campus, the daughter of Jim and Karen Raterman had a chance to do just that as she was inducted into the UD Athletic Hall of Fame. Raterman seemed destined for greatness from the time she stepped on the basketball floor at Versailles High School as a freshman, with sister Jacki Stonebraker as her coach — and she has never failed to exceed those expectations. In a storied high school program, she is the all-time leading scorer (1,673 points) and rebounder (915). In her first taste of state tournament basketball, she didn’t back down an inch when facing future OSU star Jantel Lavander and Cleveland Central Catholic. While the 6-4 Lavender had 14 points and 14 rebounds in a 51-39 victory over the Tigers, the 6-1 Raterman countered with 13 points and seven rebounds. That set the bar for the senior season and taking the Tigers where they had never gone before — bringing the state championship trophy back to Versailles. And they did it in style with a perfect 28-0 record. Raterman followed a 27-point, 19 rebound effort in a 75-60 win over South Euclid Regina in the semifinals, with a 17-point, 10-rebound performance in a 51-33 win over Sugarcreek Garaway in the state championship game — played on a Monday due to heavy snow on Saturday. She earned MVP honors for the tournament. “We had a group of girls that worked hard and was focused on accomplishing a goal,” Raterman said. Then, she made a decision that would transform the future of the University of Dayton women’s basketball — as coach Jim Jabir was just beginning a course that would put UD on the national map in the sport. “It was a little bit of a controversial decision,” Raterman said about having the opportunity to go to bigger program. “But, we (her and other talented players) believed in the vision coach (Jim) Jabir had for the program. After going to the WNIT in her first season at Dayton, Raterman led the Lady Flyers to three straight NCAA appearances — the first in the program’s history. The numbers she accumulated along the way speak for themself. Her 1,832 points and 915 rebounds alone make her one of the best to ever wear the UD uniform. Raterman also ranks fourth in career 3-pointers (184) and fifth in games played (130) and is also in the top 10 in career shooting percentage (.496), 3-point field goal percentage (.376) and free throw percentage (.811). Dayton one its first A-10 title her senior year and had a record of 90-41 during her four years in the program. She was three-time All-Atlantic 10 (two-time First Team), A-10 Rookie of the Year in 2009 and the first player in A-10 WBB history to be named to the conference all-tournament team four times. Off the court, Raterman was a two-time CoSIDA Academic All-District selection and was named a Lowe’s Senior CLASS All-American as a senior. But, what truly epitomized Raterman was what took place at the A-10 tournament in 2011, her junior. Despite, tearing her ACL in the semifinals, she played in the A-10 championship game the next day. And she didn’t just play. She had 19 points and seven rebounds in a 67-60 loss to Xavier. After graduating with a double major in mathematics and science, education and allied studies, she played in Europe for a short time before returning to work as an operation research analyst for Booz Allen Hamilton. But, she couldn’t say goodbye to the sport that had been such a big part of her life. She spent time coaching at Versailles and Fairmont along with the Dayton Lady Hoopstars. “It seemed like every moment away from my real job, I was training, coaching or watching film,” Raterman said. So after three and a half years, she made the decision to become director of video operations for the Miami University women’s program. “I decided I was still young, I would take chance,” Raterman said about her passion to be around the game. When Megan Duffy became the Miami coach, she kept Raterman on as video director and this year, she has been promoted to assistant coach. And what does she recall from her time as a Flyer. And on Sunday, she could look back and enjoy the amazing journey basketball as taken her on —- all the way to the UD Hall of Fame. https://www.dailycall.com/wp-content/uploads/sites/30/2019/01/web1_011319mju_JustineRaterman-1.jpgMike Ullery|Call Photo Former Versailles and University of Dayton basketball standout Justine Raterman is congratulated by fellow Hall of Fame member Brian Harlamert after her induction into the University of Dayton Hall of Fame.